This lecture explores the possibilities of flexible sculpture as social practice that engage communities in a personal exploration and social connection. The Roots is a site-specific, handcrafted, and interactive fiber sculpture. It was inspired by nature and employs a stunning ensemble of innovative fiber art and sculptural works, many of which were originally developed with varied communities as social art projects and have subsequently been part of installations, workshops, and performances, including the French American International School, The Old Mint, the San Francisco International Arts Festival, Alonzo King Lines Ballet, and the Museum of Performance and Design. After a brief lecture on textile and art industries, artist Latifa Medjdoub will discuss The Roots as a unique tool to generate creative and personal connections that inspire new reflections on larger social constructions. Latifa Medjdoub was born in France. 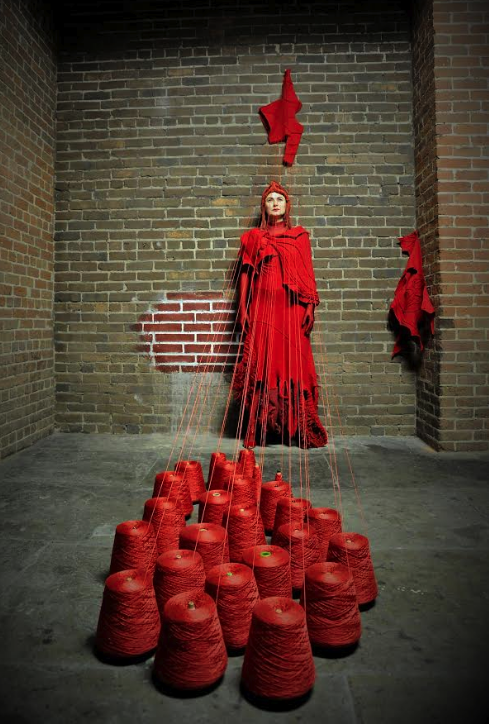 Her mediums include social art sculpture and installations, photography, painting, and performance. Her work raises questions of identity, social roles, and the metatheatricality that shapes humanity. Educated at the École Supérieure des Arts Appliqués et du textile of Roubaix, France, Medjdoub collaborated with leading performing arts artists. Her work has been shown in museums and galleries in Europe, Asia, and North America including the Museum of Art and Industry, France; Cheongju Art Center, Korea; De Cordova Museum, MA; Santa Fe Art institute, NM; National Building Museum, DC; Blue Star Contemporary Art Museum, TX; Fort Mason, San Francisco; The Museum of Performance and Design, San Francisco. Bay Area Emerging Museum Professionals will examine programs with a therapeutic benefit. After a successful and very pleasant time in one of the most beautifully conceived workshop and showroom of the Bay Area, we are back at Shopfloor SF! Join us and collect unique designs + share a drink from the neighbors (Shopfloor adjoins the wide open space housing Harmonic). Expect original new one of a kind pieces and up to 60% off past collections. Inspired by the architecture of nature, Latifa's sculptural clothing designs blur boundaries between art and fashion. Niki's jewelry explore pairings of plastic, wood, semi-precious gems, and fabric with silver and gold. The Roots project is structured to engage with the unique installation of a massive, site-specific web of hand-crafted mixed natural fibers sculptural elements. The installation is designed to engage the public with the notions of energy and perception, space and history. Spanning the whole open space of the archive, the installation is an aleatory open-ended structure that evokes the passing of information and the interworking of life. As an interactive, kinetic sculpture,The Roots disrupts our reality and enliven our senses by offering a three-dimensional, immersive, dynamic, and tactile experience reconnecting the mind and body and actively encouraging creative thinking and inspired reflections on the multiple levels of interconnectedness of individuals and networks. The Roots employs a stunning ensemble of innovative fiber art and sculptural works, many of which were originally developed as social art projects and have subsequently been part of installations, workshops, and performances at the French American International School, San Francisco’s Old Mint, the SF International Arts Festival, and Alonzo King Lines Ballet. Please join us for the opening reception of Echoes of Nature, a sculpture exhibition, December the 13th from 3pm to 6pm. Parents, thank you for bringing your children. The Red Vine, a silent social art performance will be presented during the opening reception starting at 4pm and will feature Florentina Mocanu, Amy Munz, Tonyanna Borkovi and Nathalie Brilliant. The Echoes of Nature series was conceived and executed during the creation of the ever growing Roots fiber sculptures project (on view simultaneously at the Museum of Performance and Design in San Francisco until the end of December). The sculptural pieces seek to bring the same materials, methods, and inspiration used in The Roots down to the scale of the body, celebrating life, energy and creativity. Doing so places a renewed emphasis on the beauty of the textiles while highlighting the delicacy and fineness of their organic forms. These pieces invite the observer to meditate upon the complexity of the relationship of the form to the space. The interplay of the sculptural and wearable aspects of the pieces further invites the viewer to approach the work, while reinforcing our own places and relationships to the natural world. Presented by In Space, Felt Encounters celebrates the history of the Pacific Felt Factory by featuring artists who represent a resurgence of felt works as fine art. Industrial felt is the material of choice for these artists. A wide range of multi-disciplinary approaches merge traditional felt-making crafts and fine art in this unique exhibit. images reinterpret the enduring image of the doll, playfully evoking our multi-faceted, overlapping identities in modern society. Using Beautiful Roots a social art piece created in San Francisco in 2014 with the French American International School community, Conversation with the Roots is a site-specific installation and experimental performance designed to engage public awareness in the complex discussions surrounding the diverse facets of the question of surveillance as expressed through the movement of the material and the performers. The sculpture's system of tension will be responding to the surrounding energies through a game of construction and altered structure causing a new mode of seeing, generating new relations between individuals brought to intersect and interact and seeking to meditate on what defines information in the age of mass surveillance. The Installation will span the lobby of the Cowell Theater, and remain in place during the entire festival. The performances will feature Florentina Mocanu, Amy Munz, Nathalie Brilliant, Val Sinckler, Tonyanna Borkovi and myself. Sound artist Derek Phillips will create the audio for the performances and film maker David Schendel will be creating a time-based video art studying the process of creation and interaction with the public. The structure will assume different forms at each performance, and you are welcome to attend multiple experiences. (San Francisco) - The MUSEUM OF PERFORMANCE + DESIGN (MP+D) continues its exploration of the body in performance with Latifa Medjdoub: Sublimated Masks, an exhibition of costumes, fiber sculptures and prints by French artist LATIFA MEDJDOUB originally developed for the revival of Jean Genet's play The Balcony by COLLECTED WORKS(February 2015). The exhibition conveys the theatrical universe of Genet's landmark play as materialized through Medjdoub's elaborate designs and the theatrical vision Collected Works directors Michael Hunter and Jamie Lyons. The exhibition opens April 16, 2015 with a reception at 5:30pm, a performance at 8pm, and an artist talk at 8:45pm. The exhibition runs through June 20, 2015. Genet's play tells the story of a revolutionary uprising in the streets of an unnamed city. Most of the action takes place in an elite brothel or "house of illusions," where clients act out their fantasies of institutional power. They play judges, bishops, and generals as their counterparts in the "real" world struggle to maintain their authority. By staging Genet's play inside the San Francisco Old Mint, Hunter and Lyons invoked the building's own identity as a stronghold of power through San Francisco's turbulent history, further blurring the line between reality and illusion. With a complex layering of iconography and soft textures, Medjdoub's designs expose the dimensions of reality and illusion, and reveal Genet's concern with metatheatricality, role-playing and the glorification of the image and its reflection. Tending towards exaggeration, they represent an amalgam of internal desires and external realities, ultimately presenting the idea of the costume as a sublimation of character. The exhibition stages 45 costumes, fiber sculptures and prints by Medjdoub including the characters of the Queen, the Bishop, the General, the Judge, the Police Chief, St Theresa, the Horse, Rosine, the Thief, and the Envoy. A video footage by Jamie Lyons bring the remembrance of Collected Works' February performance and complete the installation. Born in France, LATIFA MEDJDOUB has been living and working in San Francisco since 2000. Her work's most consistent theme is the mixing of genres, tools, and techniques, an approach perfectly suited to her continued exploration of the phenomenon of social mixing and hybridization that continually redefine global culture and communities. Trained at the École Supérieure des Arts Appliqués et du Textile of Roubaix, France, Medjdoub collaborated with leading artists including Philippe Guillotel, Yvonne Sassinot de Nesle, Christian Lacroix, Gabriella Pescucci, Marina Draghici and directors Philippe Decouflé, Yves Angelo, Marcel Maréchal, Raul Ruiz, Chris Terrio. Her work has been shown at the Museum of Textile and Fine Arts, Roubaix France; Cheongju Art Center, Korea; De Cordova Museum, MA; Santa Fe Art institute, NM; National Building Museum, DC. (latifamedjdoub.com). COLLECTED WORKS was founded in 2012 by a group of directors, actors, and designers, most of whom met in the PhD program in Drama at Stanford, where they worked under the guidance of Carl Weber. Collected Works explores a collaborative model that coalesces classic texts, physical performance, and sound and design elements in unconventional spaces with the goal to inspire audiences to form personal relationships with the characters within the performance and the places in which they perform (www.collectedworks.org). Founded in 1947,the MUSEUM OF PERFORMANCE + DESIGN stands out as one of the largest archives on the performing arts in the nation. Its collection of 3.5M items holds a part of the rich history of performance and theater design in the West and a part of the unique history of the city of San Francisco. MP+D is a 501(c)(3) non-profit organization. For further information on the collection, programs and exhibitions, visit MP+D at www.mpdsf.org or call 415-255-4800.